A regular of Molly’s weekly group classes, Tom knew that a yoga practice was having a positive impact on his body & mind, but was keen to learn how the practice could be specifically used to assist with his anxiety - alongside the talking therapies he had already undertaken. Over x4 in person 90 minute sessions Molly devised personalised, gentle yoga movements, synched with the breath & chanting designed to disrupt spirals of anxious thinking whenever they arose. These practices helped him shift his attention to the here and now of his physical body and away from the preoccupations of an over active mind. The breath lengthening aspect of the practice helped address the physiological aspects of anxiety - pacifying the sympathetic nervous system by slowing down an elevated heart & breath rate. Managing these physiological aspects then in turn made managing the anxious thought patterns a lot more accessible. As a primary school head teacher Cassie works long hours and wanted a practice that would fit around her demanding schedule. She ran a marathon a few years ago & suffered a hip injury (an acetabular labral tear). Meaning that long periods of walking would result in discomfort in the hips & low back. To prevent further injury she was also advised to not fold the hips more than 90 degrees. She wanted to improve posture, strength & flexibility without hurting her hip. She needed a personalised practice that would be supportive for her hips, fit in around her schedule & that she could develop into a daily habit. Molly met Cassie for an in person private at her home. Based on this session she designed her x8 weekly, personalised, filmed 15-20 minute sequences. Each sequence built on the ones preceding it and included some new poses & variations to help keep them interesting. The sequences particularly emphasised building hip stability & strength as well as the development of flexibility, strength & balance. Cassie received her new sequence each week (as a link to a private online film) and after she had tried it once, Molly & Cassie would have a weekly call to review how the practice was going. Cassie was super committed and did her practice x6 times a week. Within just two weeks in she reported her hip discomfort much reduced & that her shoulders were less tense. Four weeks in she went for a long walk around Hampstead Heath and was delighted to report that for the first time in years her hips & back did not start to ache after the walk as they normally would have done! About 6 weeks into the practice on her feet walking around London for 7 hours & didn’t experience pain in her hips & low back at all! Nadine first met Molly & Nid when she joined an Omega Movement wellbeing retreat in Andalusia October 2017. 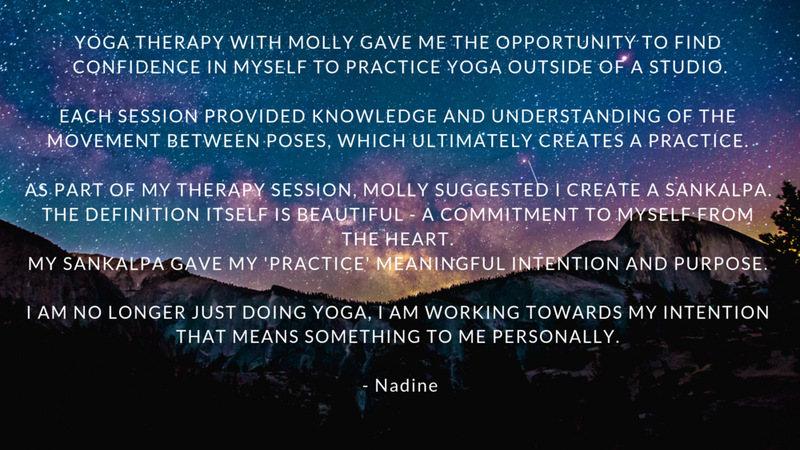 Once back in London she did two courses of yoga therapy (8 sessions in total) with Molly - in order to build personalised practices that were a form of self support & self care & way of coming back to balance. The self care was especially important at that time as Nadine was navigating the challenges of a very demanding and expanding role at work and as a result, was re-considering her career options so she was also seeking some space & clarity of thought from the practices also. We focussed on building a sequence of physical movements that she enjoyed and so would feel compelled to do them independently between sessions. These physical yoga poses were coupled with breathing and meditation practices to help bring balance to her breath pattern and to give Nadine tools to maintain her inner calm; despite external pressures at work. These tools meant that even if she could not directly control external sources of stress at work, she was able to choose how she responded to them. We did some work on the idea of ‘Sankalpa’ or the ‘heart’s desire’ in yoga and how this can be a more compassionate means of goal setting or guiding lifestyle choices, and how it also can help steer career choices & inform life direction. We also explored journaling during the retreats that Nadine used to help her manoeuvre through the challenges she was experiencing at work. Nadine then joined the second retreat that we ran in Andalusia in May 2018 and is is currently working with Omega Movement Nutritional Therapist Chloe.